This powerful little companion speaker has a built-in 1,800mAh lithium battery with a play time of 5 hours at full max volume so you can take it with you on your family outings.The built-in full range driver and 360° omnidirectional sound effect processor delivers an exceptional balance of loudness and bass performance for its size. With the hands free calling, if you get a phone call it can also pause your music and resume where you left off once you’re done. 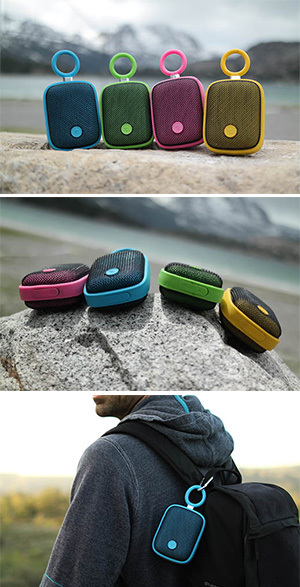 The Bubble Pods’ simple and convenient design makes it easy to hook onto a D-ring to take with you wherever you want on your clothes, stroller, or backpack and comes compact enough that you can fit it into your pocket too.